Slingshot: New Gaming Services comming soon. Forums › Slingshot and CallPlus › Slingshot: New Gaming Services comming soon. 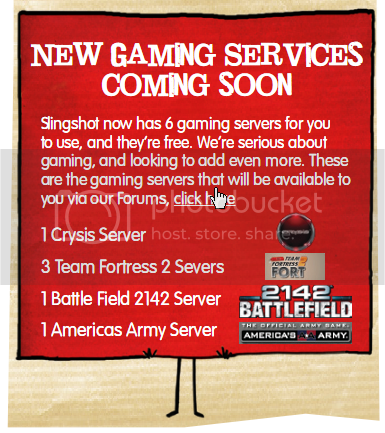 Just got my xmas newsletter and I noted this, New Gaming Services coming soon. hellonearthisman: Where is the error? Looks good that some ISP's are thinking more about their users. lol @ spelling. Yeah it's nice to Slingshot trying to fill the gap of XTRA closing it's games server.